There was a lot going on at Google I/O on Wednesday. 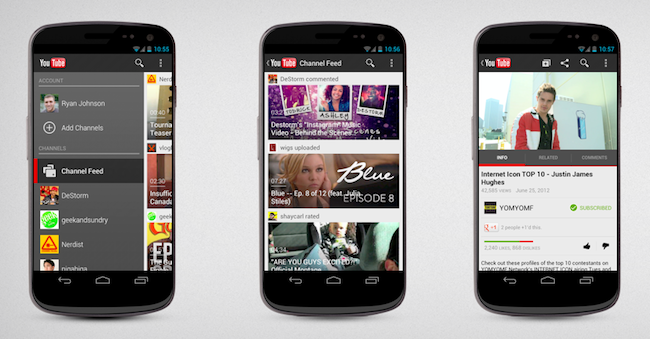 Tablets, spectacles....an update to YouTube for Android was rolled out too. What with all the hullaballoo surrounding the launch of Google’s 7-inch Tablet on Wednesday, and the fuss over people jumping out of planes wearing Google-made spectacles, it’s little wonder that news of a makeover for Google’s YouTube Android app fell by the wayside somewhat. The neatest development with the new version is the ability to prep your device with videos you want to watch. “You can now preload and temporarily cache videos from your subscribed channels on your phone anytime it’s charging and your Wi-Fi is connected,” Andrey Doronichev, head of YouTube mobile, wrote in a blog post about the changes. To enable the function, all you need to do is choose “preload” in the settings menu. You still need a connection to watch the videos, but the bonus is you won’t be faced with that annoying stop-start-stop experience that can sometimes come with a YouTube viewing. Theoretically, the video should play smoothly right to the way through, greatly reducing the chances of you throwing your smartphone out of the window in frustration. Developers have also revamped the interface to make better use of the limited screen space that comes with having a small device. This has resulted in a new guide on the left side of the screen, giving users instant access to all of their channels, as well as a feed that presents users with an ever-changing array of new videos. The downside is that the new version is currently only available for Android 4.0 devices. However, the YouTube team is working to bring the changes to devices running earlier versions, as well as to the iOS app. Google bought YouTube in 2006 for $1.65 billion. The site has 60 hours of video uploaded to it every minute, while a colossal four billion videos are viewed each day.